There are some good reasons to believe that Skye and Raina are part of the Marvel race known as Inhumans. Inhumans are similar to mutants, but they live apart from humanity and their powers are only activated when they come into contact with a chemical called Terrigen Myst. 1) We know Skye is important and different we just do not know exactly how. 3) Something/Someone showed up when she was found and eliminated an entire Chinese village as well as a SHIELD team. Almost no one survived with the exception of Skye. 4) Anyone connected with Skye was being hunted and killed by someone who was searching for her. 8) Rainna has no loyalty to Hydra or the Clairvoyant but was primarily interested in getting one question answered, "What will I become?" 9) Skye reacted differently than Coulson and Garrett to the Kree Serum. She has shown no signs of gaining cosmic awareness like both of them did. "For you and others like you. People with gifts, I'm waiting for what's inside to be revealed. The girl, Skye. What do you know about her? Where does she come from?" "Because inside, I believe she and I have something in common." The question of "What will I become?" is absolutely central to the Inhumans. They do not know what will happen when exposed to Terrigen. They could become super powerful or they could de-evolve into monsters. The question that Rainna posed is the biggest question an Inhuman has prior to Terrigen Exposure. The story of Karnak illustrates the "What will I become?" dilemma. His older brother mutated monstrously when exposed to the Terrigen. In fear of what could happen to Karnak, his parents they avoided exposing him. Instead, he trained in a monastery and meditated to develop his powers. Skye's reaction to GH 325 Kree based serum may have been more normal due to her being an Inhuman. As the Kree created the Inhumans in the first place by experimenting on humans, some Kree DNA could exist within the Inhumans. This would make the transfer of a Kree based serum easier than it would be for a normal human like Coulson. Mark my words one way or the other Marvel is planning on introducing the Inhumans. There is some speculation that the first character that Vin Diesel agreed to play was Blackbolt the King of the Inhumans. In the recent story of Inhumanity the city of Inhumans Attilan crashed to Earth and spread Terrigen in the Earth's atmosphere forcing those of Inhuman lineage to alter all across the planet. Attlian was on Earth for a long time and Inhumans had offspring that went on to live their lives as normal humans often times not knowing about their special lineage in the first place. This brings up the question if Skye is an Inhuman then who is her Father. A picture of her father was depicted. He seemed like a shadowy person in power living in a slum in Asia. My guess is that he is Maximus the Mad. The evil brother of the King of the Inhumans Blackbolt. It would make sense for him to have been kicked out of Attilan and living on Earth. Maximus the Mad has the power to control minds, a bit like a real Clairvoyant. He is very intelligent but completely nuts. He lost his sanity from being too close to his brother Blackbolt when he used his sonic scream. .
Blackbolt fires his sonic scream upon an enemy Kree ship and destroys it. 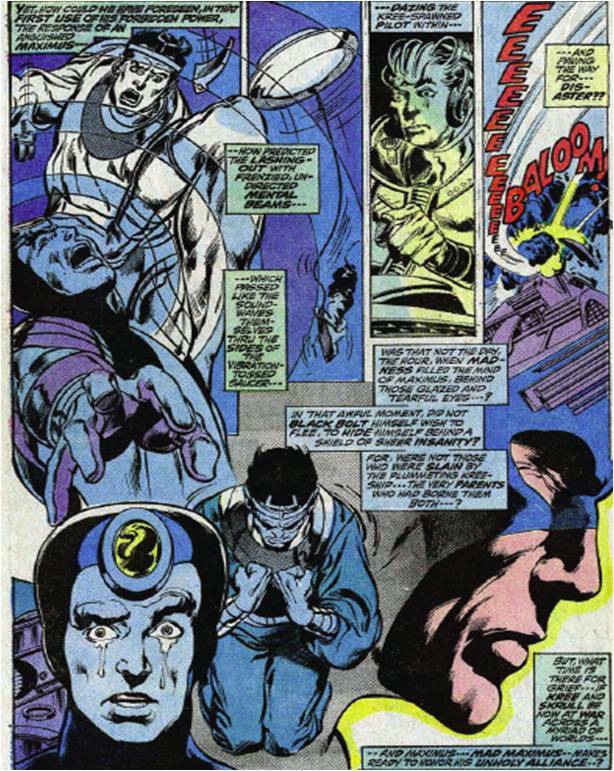 Blackbolt did not fully understand how powerful his scream was and it ends up killing his own parents. Maximus's sanity was another victim of the scream due to his close proximity to Blackbolt. The sonic scream scrambled Maximus's mind irreparably. While Blackbolt feels terrible for the damage he has done to his brother, he can only tolerate his acts of violence and defiance so much. Maximus is often imprisoned or flat out banished from Attilan. Which could be why he is on Earth amongst the humans.